Fields of Blood: KOW - Best Game Aid You Can Use.....And It's Free! KOW - Best Game Aid You Can Use.....And It's Free! Over the past few weeks there has been discussion about timed games, playing quicker etc. One thing that I do when going into an event is build up my army cheat sheet. I use this in conjunction with the Easy Army list as a basis for a lot of my decisions. Above is the one I created for my Herd army I used last week. 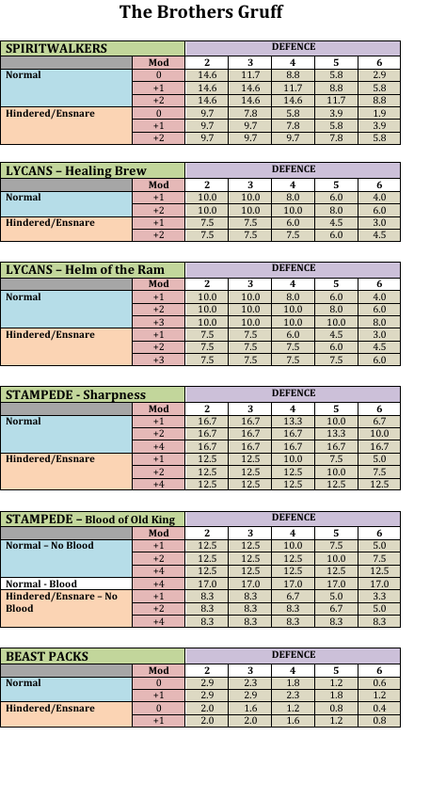 It lists the units I have in the army and for each determines the expected wounds against each Defence level. 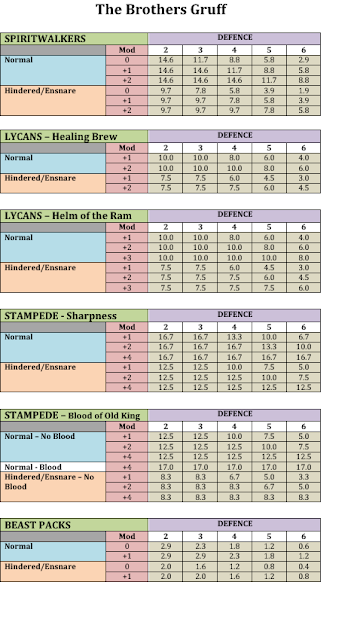 The two Lycan units could be condensed purely into the second Lycan table in retrospect. To determine the wounds I have a spreadsheet "Abacus of War" which was built based on the the "Kings of Math" calculator available in the Mantic Forum. My version looks at stand deviations so gives me expected wounds at different confidence levels. In-game, this means I'm not having it work things out in my head. I can charge my Lycans with Helm of the Ram into De 6 and know I'm expected to do six wounds whereas at De 3, I'll likely do 10. I also know having looked at the stats that I only have about a 5% chance to do more than 8 wounds versus De 6 or more than 12 versus De 3. That information informs every choice I make. Lycans can't go in frontally unsupported against De 6 and a Beast Pack is unlikely to make much difference. However two Lycans can break it. With a Stampede with Blood of Kittens I can be expected to do 17 wounds regardless of target which will generally be enough. You reduce the opportunity for your opponent to make decisions during your turn thereby pressuring his clock. The sheet is quick to make and populate - 15-20 minutes - but is probably some of the best preparation you can do pre-battle. Cheers on this! I saw you reference something like this in an earlier blog and have been kicking around making one myself. Now I have no excuse. It's mathemagical! I should prepare one of these as I work out what changes to make to my ogres for CoK 2017 rules. While some think it is fun-sapping (Guy below) I see it as planning. I understand Guy's approach but I like to have expectations re combat outcomes before I go in. If I need my dice to roll up then I better be in pretty desperate straits before I attempt it. Personally I think this takes some of the fun out of the game. Working out rough probabilities is part of competitive play but using tools to calculate expected outcomes makes the whole thing a bit sterile.